Ever since getting diagnosed with Celiac disease, I always play this game with myself that I like to call “gluten pass”… it goes something like this… if I were to get a gluten pass where I could eat anything and I wouldn’t get sick, I would eat ____”. It always ends up with a list similar to: croissants, Costco pizza, In N’ Out cheeseburger WITH bun, Greek spinach pies in filo “spanakopita”, and Cinnabon. My list changes from time to time, but without a doubt Cinnabon ALWAYS makes the list! 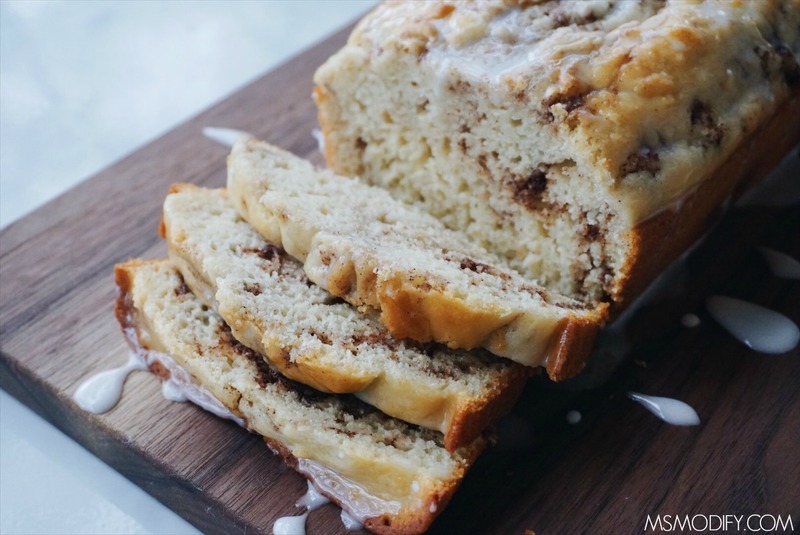 You guys, this cinnamon roll bread literally is soft and fluffy like bread, but has the cinnamon roll inside and tastes like Cinnabon! It’s the perfect treat for breakfast, dessert or even a snack! Preheat oven to 350 degrees. Grease a 9 inch bread pan and set aside. Mix sugar, egg, vanilla, Greek yogurt, and milk in bowl until combined. Then stir in dry ingredients until evenly mixed. Prepare the swirl by mixing brown sugar, butter and cinnamon together. Pour about 1/3 of batter into pan. Spoon ½ of swirl mix into different spots in the bread batter. Use a knife and swirl around. Add the last of the batter. Use knife to create swirls. Mix glaze and pour over loaf of bread. This entry was posted in Recipes/Dining Out and tagged baking, bread, breakfast, cinnamon roll. Yummy, this looks super delicious! Thanks! I always try just to take a bite of what I bake, but I admit it…I had like three big pieces! This looks amazing! I seriously am impressed with the quality of gluten free recipes lately! Thanks! Ya I’ve realized homemade gluten free baked goods are much better than store bought! this looks so good! I try to avoid gluten when possible but its so hard with delicious things like cinnamon rolls and (good) bread! Will add this to my list of things to try!! This looks delicious! My mom eats mostly gluten free, I’m sure she’d love this! Can regular flour be used? Yes! All my recipes are cup for cup, so they can be made non-gf or gf! What kind of flour do you use for this bread? I always use Cup4Cup! It’s my favorite! Made this today and all I can say it OMG. It was wonderful, and I didn’t have that nasty GF taste either. thank you so very much. You can use a dairy free yogurt made from almond milk or coconut milk. If you can’t find those (they should be at Sprouts, Wholefoods or other specialty grocery stores) you can also use full-fat coconut cream. Allow a can of full-fat coconut milk to settle (about 1/2 hour). The coconut cream will rise to the top and can easily be skimmed off. I’ve never made it using these, so I can’t guarantee the flavor won’t change. If you try either of these, let me know how it turns out! Good Luck! FYI, Cup4Cup flour blend also has dairy in it. I used it for a long time as well and finally looked at ingredients because my husband was still having issues. Yes, unfortunately it does! The Cup4Cup gluten free wholesome flour blend is dairy free. I haven’t tried it yet, but I’m a big fan of Cup4Cup so I’m hoping it’s as good! I have made this several times. So simple I have it memorized now. Usually I double the cinnamon, brown sugar and butter. Have also made in muffin form, prefer in a loaf though. My favorite for baking is also the Cup4Cup. Thank you for the recipe! I have it in the oven again right now. Aww thanks for letting me know! I love that you’ve made it so many times! I’ve never tried making muffins with the recipe, great idea! Hello, I have on-hand Bob’s Red Mill 1 to 1 All Purpose Flour, would that work with your recipe? This bread sounds amazing! Any idea what steps to use for a breadmaker? Thanks! I never use a breadmaker so I don’t know much about them. I will look into it and see if I can help you out! OH MY WORD. After having to go gluten free over a year ago, I had yet to make myself cinnamon rolls. I didn’t want to go through the struggle of working with yeast. I finally stumbled across this gem of a blog! Even though we live in a cinnabon world…these are everything I ever imagined after not having really any cinnamon desserts for over a year. I doubled the swirl ingredients and so glad that I did! This is amazing! Thank you! I’m so glad you enjoyed it! Doubling the swirl sounds amazing… great idea!! I have the worst luck with paleo bread recipes…. I should’ve made this recipe as muffins instead, the inside is very gooey (though still cooked). Maybe it’s the Bob’s GF Cup4Cup, maybe it’s the glass bread pan, I don’t know. The taste is awesome, the texture was just off for me. I’ll absolutely keep this and try muffins next time! I also would love to try substituting honey or maple syrup for some of the sugar! I personally only use Cup4Cup flour. I find that Bob’s Red Mill stays gooey like you’re describing. Which brand of flour did you use? Also, I recommend always baking bread in a metal loaf pan. You should try it again and let me know! Good luck! I find it at Sprouts or Wholefoods. Sometimes Target has small bags too! But, I find it cheaper on Amazon so I always buy it there! I highly recommend cup4cup, that’s all I use to bake! If I don’t have that flour brand can I use a different multi purpose GF flour? Have you tried any other flour brands with this recipe? Thank you! I have tried other gf flours and cup4cup always turns out best, but you should give it a try with what you have! Just be sure to check the bread with a toothpick to see when it’s done, because baking time may be a little different. I guess I am a little ignorant about the term gluten free, but how is this recipe considered gluten free if the first ingredient listed is flour? This recipe looks really yummy! It’s made with gluten free (gf) flour! I always use cup4cup brand and highly recommend it! This looks so yummy! I will definitely be trying it. Since my daughter was diagnosed with Celiac disease, the things we have missed most are toast and sandwiches. I have tried several yeast bread recipes and have yet to find one that is satisfactory. I am now wondering if a batter bread that could be toasted and sliced thin for sandwiches might be a better option. Most of the gluten free quick breads I have seen have fruits like bananas or pumpkin in them. I haven’t seen any plain ones. Do you think that if I left out the cinnamon swirl on this recipe, it would be good as a plain bread? Thanks for your help. I miss bread the most too and have found quick breads work best for me! I’ve made a gf cheese & herb bread (http://msmodify.com/gluten-free-cheese-herb-bread/) and japlapeno cheddar bread (http://msmodify.com/gluten-free-jalapeno-cheddar-bread/) that will probably work better for sandwiches. They are pretty moist so be sure to toast them well so they don’t fall apart. I highly recommend you use Cup4Cup gf flour. I’ve tried other large brand gf flours and they don’t cook all the way through for me. If you try these for sandwiches let me know how it works! Oh, my goodness! Tried the cinnamon roll bread last night, and it was delicious. Really does taste like cinnamon rolls. I used Bob’s Red Mill 1 to 1 flour because that was what I had. I thought the batter seemed a little thin, but the toothpick came out clean at 45 minutes just like the recipe said. It was a little moist so might try baking it 50 minutes next time. But the flavor was wonderful! Thank you so much for this recipe. I will definitely be trying the cheese breads you mentioned. Haven’t tried toasting it yet, but Yay! for having bread again! How about almond and coconut flours in place of cup4cup? I don’t know if this would work since almond flour is much more dense and doesn’t have xanthan gum (which gives it the elasticity). You also may need to add another egg. The flour replacement wouldn’t be 1:1, you’d have to play around with it to make sure the consistency works. If you try it, let me know what you did & how it turns out! Thanks but would make it to take to breakfast club at work and what if it isn’t good? We love our breakfasts! I’ve been researching this for you and I think you can use cassava flour (make sure it’s not tapioca flour) in place of the cup4cup and follow the recipe the same. From what I’ve been reading cassava flour can be used 1:1. I haven’t tried freezing it, but I don’t see why you couldn’t. I just would hold off on the glaze. Do you have a printable for this recipe? I don’t, but that’s something I want to start including! I’m sorry! Hi! I was so excited about the recipe, I found it in “Delicious Living” magazine. But, I used Bob’s Red Mill GF flour and the bread was so gooey even after cooking it for over an hour! I’ll definitely try Cup4Cup next time. I try not to speak poorly of products, however, I’m not a fan of Bob’s Red Mill GF flour. Every time I’ve ever tried baking with it, it never cooks through and is soggy in the middle. When I make the exact same recipe with Cup4Cup, it comes out great! I’m so sorry to hear you didn’t have luck either with Bobs Red Mill for this recipe. I really do hope you’ll give it another try with Cup4Cup! This was really good…like a cinnamon coffee cake. I used Premium Gold all-purpose GF flour, whole-milk yogurt (because that’s what I had), and a glass loaf pan. I baked it for 48 minutes and tented the loaf with foil the last 15 minute, as it was browning well on top, but not yet done in the middle. Will make again. Thank you for the recipe! This recipe was printed in a magazine and that was how I was introduced to your Web Site. It tastes great and being a cinnamon lover this is perfect. I like your philosophy of “modify” after being diagnosed with Celiac Disease. It is a helpful way to approach things. I will be trying more of your recipes while eating gluten free. Is there a way to print recipes that don’t have a print button? Thank you and welcome! I try to face all challenges in life with a positive attitude, and that goes for celiac as well… I don’t have to miss out, just modify it! Right now there is not a print button on that recipe, but I will be updating that soon! I love it. Been GF from 2000 and always looking for new recipes. Got it out of magazine at the grocery store. Tried it with raisins and one time with banana. Loved both. Used Bob Red mill one to one GF flour. Baked it longer and left out yogurt. Still awesome. Glad you liked it!! Good to know it works well without the yogurt too! Baking times always vary a little based on which flour you use. THE first bread I have enjoyed since going GF over a year ago. Easy to make, soft and delicious. Thank you SO much!! This is seriously amazing!!! I used about a cup of Krustceaz GF AP flour and a cup of Bob’s Red Mill GF 1:1 (because I was using up what I had) and baked it 50 min in a stoneware bread pan in a convection oven. I put foil over the top the last 15 min to prevent too much browning. It turned out perfectly!!! I transitioned to GF several months ago due to muscle pain and stomach pain issues – it has made a tremendous difference for me. I have missed having something sweet – this bread is perfect! I will be freezing it in portions. Thank you so much for sharing your talents! Just found out my LO is GF and wanted to know if you know of a good roll or bread recipe. my LO loves bread!!! I followed the directions, baked 55 mins, toothpick came out clean. Cinnamon mix went to bottom. That would of been ok but when I cut bread it was gummy. Bread went into the trash, will not make again. Hi Debbi, I’m so sorry this didn’t turn out well for you. I make this all the time and have never had these issues. Can I ask what flour you used and if you substituted anything in the recipe? I am dying to make this for the holiday season! Would using coconut sugar (or even honey/maple syrup) in the cake and the swirl yield a different result or could I sub it? Thanks! I just made this over the weekend and used coconut sugar and melted coconut oil in place of melted better for the swirl and it turned out great! I want this for Christmas morning breakfast but not sure if I’ll have time to do the entire thing that morning. Could I make the dough or do some of the recipe beforehand and finish it in the morning? Have you ever done this or is it best just doing it all at once? Thanks! Ok! If I fully made it Christmas eve to enjoy Christmas morning would it still be super yummy after sitting overnight on the counter or is it best fresh? Merry Christmas! Yes, I would bake it but leave off the glaze and wrap it with plastic wrap. Then make the glaze in the morning before you serve the bread! Sometimes I cut the bread into slices and put it in my toaster oven and then put the glaze all over the top! Merry Christmas!! Should the greek yogurt be whole milk? Does it make a difference? Mine turned out great. Smells so delicious. I had a heck of a lot of lumps when I made this as directed and had to stir for a good 10 minutes to get all the flour incorporated. I didn’t get to taste test it so not sure how all that stirring affected it, but it looked ok, if a little low and dense. Second time around I sifted the flour and mixed the sugar with the dry ingredients then stirred the wet into the dry (as opposed to the dry into the wet) and the lumps dissipated a lot faster. I got a much better rise with this one. Do you cool this completely in the pan? How did it turn out? It’s definitely a thick batter, but I typically don’t get lumps. What brand of gf flour did you use?